“I’m done, Mrs. B.!” a student exclaimed as he tugged on Mrs. B.’s shirt. Mrs. B. and I glanced at each other with a plea in our eyes. It is May, and these first graders should know the routine, shouldn’t they? Writers are never done, we’ve told them. Read your book to your partner, we’ve advised. Start a new book, we’ve reminded. Mrs. B. knew it was time to revisit the routines of writer’s workshop, so she constructed a fresh chart with the help of her first graders. What I love most about this chart is the second step: Read my book to my partner and say 3 writing moves. I wish everyone could spend time in Mrs. B.’s room listening to her first graders talk like writers. Through her exquisite minilessons and conferences, the kids have learned to talk about their writing. It is a wonderful thing to witness. 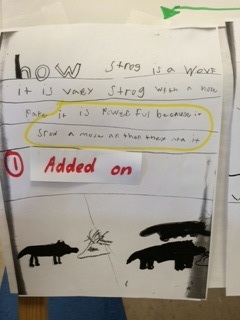 Here are two example of writing moves shared by Mrs. B.’s student. In this example, the student added on to his writing. How strong is a wolf? It is very strong with a whole pack. It is powerful because it surrounds a mouse and then they eat it. 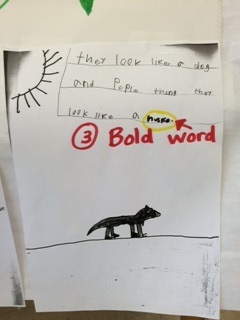 This example shows how the student used a bold word. They look like a dog and people thing they look like a husky. I will think of this chart as I am coaching other teachers. This chart captured high expectations, was simple to read, had picture cues, and contained examples. I really like the visuals of this chart. My KG2 students need a reminder like this one. Thanks for sharing. Perfect example of “teaching is never done” because we need to continue to provide tools that develop student independence. So much learning in the development of these charts and in your persistence! Yes, first graders “know it” (writing is never “done”), but they still need the reminders of what this looks like – and the second chart is so accessible for all students! 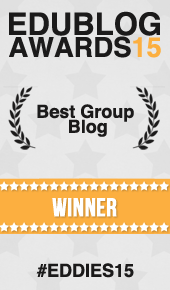 I loved reading this post and the visual examples of the charts. The collaboration between Dana and Mrs. B is so beneficial for the students. I know as the classroom teacher, when something flops, you sometimes feel stuck about how to make it better. Having a coach work with you and collaborate helps work through the hard parts and see the possibilities for improvement. 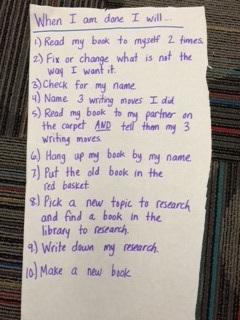 It is really impressive to me that first graders could name 3 things they did as a writer. Building in that type of reflection and metacognition in first grade will help those students fully embrace that they are writers. It makes me want to do more of that with my third graders. Great post. Even middle school students seem to want to just be “done.” I find that my kids often haven’t even completed all of the steps of the process- never mind checking over their work! This chart is a great reminder for kids. Loved these charts – especially this time of year! They know this, but the chart does support that independence we are all striving for! I love being able to see both charts. The examples are not only great for our students, but prompts great discussions for teachers we coach! Such a great point made here. 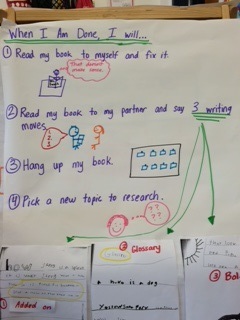 Simply revising the anchor chart helps support independence in our students. I love how they name their writing moves.